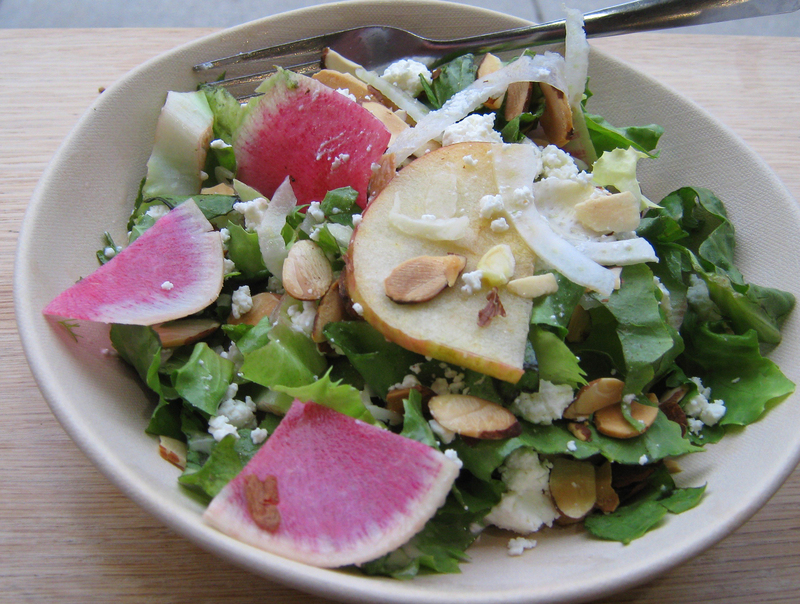 Watermelon radish hidden in the salad, uncovered! In the heart of Cambridge (MA) near Central Square is chef Ana Sortun’s renown Oleana Restaurant serving farm to table Eastern Mediterranean (Turkey, Lebanon & Greece) food. No surprise to many that Boston Magazine included, what it called, “dazzling” Oleana in its updated list of the 50 Best Restaurants in Boston, noting that chef Sortun’s Cambridge paradise still excites with palate-enlivening fare. Oleana garners special attention, not only for its menu with big flavor, but also for its locally sourced meats and fish, produce from its own 50-acre Siena Farm (25 miles west of Boston and run by Chef Sortun’s husband, Chris Kurth), artisanal wines and outstanding desserts by pastry chef Maura Kilpatrick. 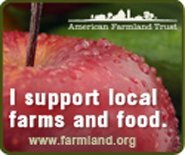 Siena Farm grows over 100 varieties of vegetables free of chemical herbicides, pesticides, and synthetic fertilizers and also sustains a 500-member Community Supported Agriculture (CSA) community, included in our directory of CSA farms in Massachusetts. And in its 14th year of operation, Siena Farm also has two farm stores, in the Boston Public Market and Boston’s South End, as well as a stall at the Copley Square Farmers Market. 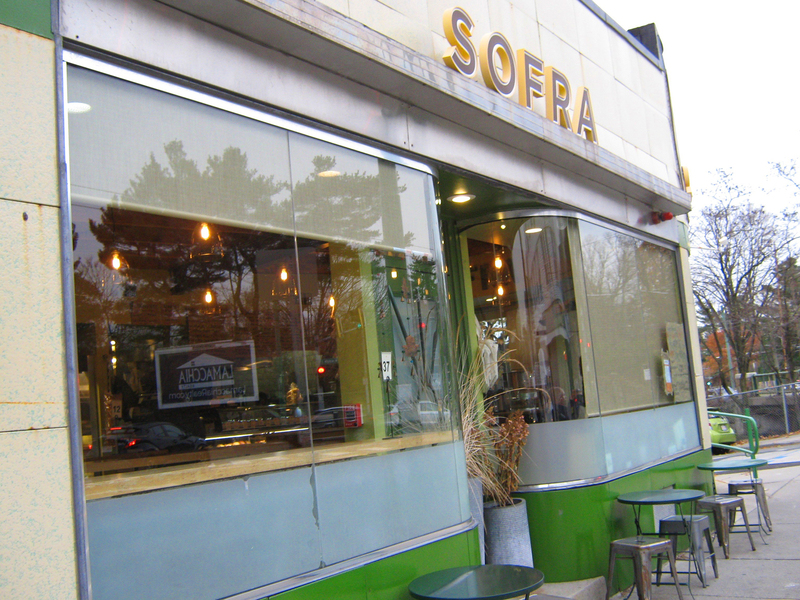 If dinner at the famed Cambridge restaurant is not doable, Oleana’s imprint also extends to a sister bakery & café, Sofra Bakery & Café, a little off the beaten path on the western edge of Cambridge, abutting Watertown, MA. Sofra is a Turkish word with three related meanings depending on its usage: a picnic, a special table preparation of food, or a small square kilim rug for eating. 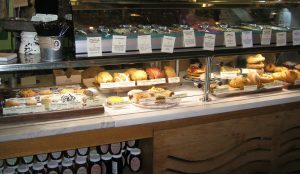 Established 10 years ago, it has become a popular neighborhood destination, which also attracts visitors to the Boston area, to savor its café menu or its many take-away offerings, including prepared foods, house-made preserves, desserts, signature spice blends, etc. 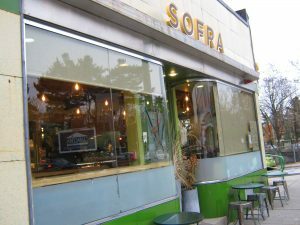 On a recent visit to the Boston area, before a thee hour drive back home to Albany, NY, lunch at Sofra Bakery & Café was a special and energizing treat. 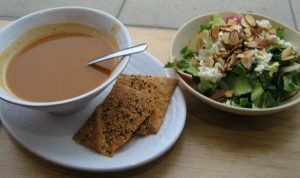 Soup and salad was an easy choice when the special soup and salad of the day in late November sounded so appealing. 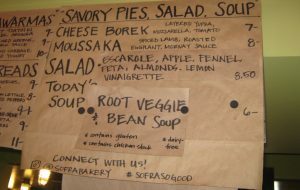 A large paper menu, hung high up over the pastry counter, listed the ingredients for the farm to table salad of the day in some detail: escarole, apple, fennel, feta, almonds, lemon vinaigrette. This was an appealing combination of ingredients that happily included watermelon radish, thinly sliced, on serving, that added an additional fall flavor to a perfect salad, expertly and lightly dressed. The dozen watermelon radishes included in my most recent CSA farm share from Roxbury Farm in Kinderhook (Columbia County, NY) took on new value seeing how they added flavor to a creative fresh salad. The accompanying root veggies and bean soup, with just enough spicy heat, was served with crisp, flavorful crackers. 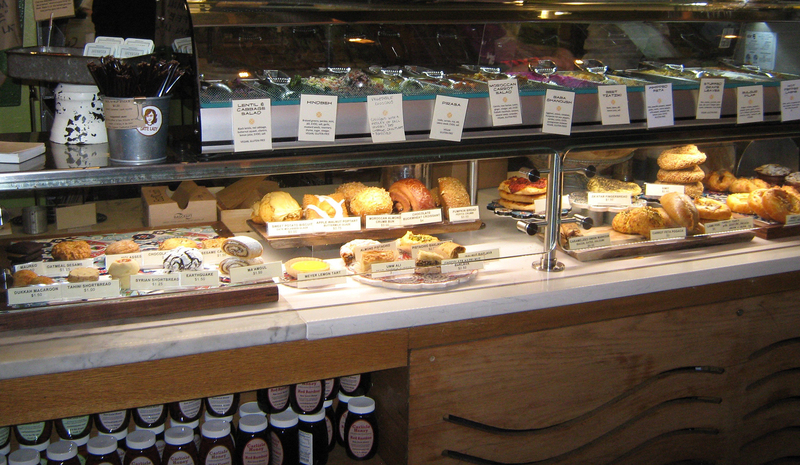 With the extraordinary desserts offered, not easy to decide on a pumpkin jam pastry. With a cup of Karma coffee (a small batch coffee roaster in nearby Sudbury, MA), the pastry was a perfect finish to lunch. The drive home on the Mass Pike was appropriately fueled for a local foods advocate. 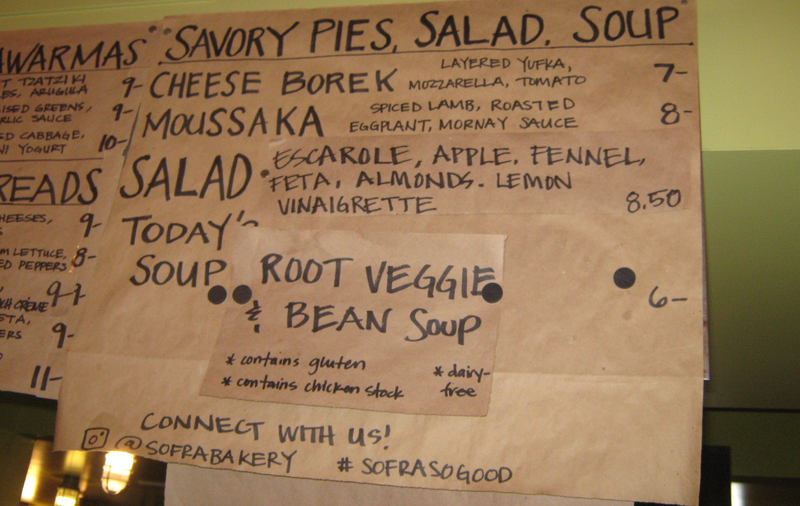 And return visits to Sofra Bakery & Café will be in store on future visits to the Boston area.